The year 2017 will go down as a big year for me personally. I finished my first book, Siren’s Call and we launched it in St Kilda in May. With the help of a terrific publicist, Carmel Shute, I found myself on radio, print and social media. My book was in shops and on line, and had a permanent presence on The Footy Almanac website, as Malarkey Publishing (aka John Harms) produced it. Huge. For this writer and artist, a dream come true. While the final editing was happening on Siren’s Call, I was one of the editors of The Women’s Footy Almanac 2017. From January, I helped gather sponsors, writers and energy for a record of the best season of footy I can remember (bar 2009 without the Grand Final for Saints supporters!) The energy and love for the first semi-professional season of recognised and publicised women’s footy, kept me afloat. The writers, footballers, fans, and games, gave me wings. The energy needed to keep this force and book going was underscored by the hard work of editor Stephanie Connell and the inimitable John Harms and of course, all the Almanac writers. I went from being guided as a writer by Glen Brownstein (another Almanac editor, stalwart and friend) and John Harms. I was guided as an executive editor by John Harms and what I’d learned from Carmel Shute. As I went to every Victorian St Kilda match again with my footy family, Uncle Bob, Cousin Gary, at times Aunty Betty (record attendance this year) and many friends, I kept writing up my match reports and submitting them to the Almanac. 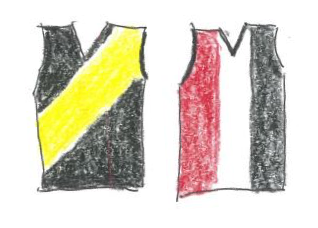 I watched St Kilda seem to fly, and then like in this match against Richmond, fizzle out. I saw great young players show something new, and old players getting slower and reaching retirement. I saw money raised for charity and how hard people at the St Kilda Social Club and the St Kilda Cheer Squad work. I saw the workings of my Club up close when I got to do a presentation of my book, and saw just how many people it takes to make a AFL Club function. I sponsored a player in the VWFL St Kilda Sharks and worried as she suffered another big injury. In the name of my late mother Elfie Rosenberg, I supported Division 1 Sharks in a weekly award for the player who showed the strength of character and effort that my mother had. The Sharks Division 1 girls get to play in the Elimination Final this week. They are showing great strength and character across the field, as is their new coach Keryn Ralph. I went to as many of the AFLW matches as I could manage, wrote about it and watched replays. I still cry a little when I remember the first night, as I did watching Angela Pippos and Nicole Minchin ABC documentary on Thursday night, Heroes which told the story of the whole season and the women behind it. Their film version of our book. Both passionate and emotional and part of our social history. I cried too when I saw John Harms and The Women’s Footy Almanac 2017 on AFL360 on Tuesday night. Our baby had made it up on the big screen where it belonged. The magnificent painting of Kate Birrell there for all to see. The fabulous story of Jasmine Conrad was told and she continues to be a star. Earlier this year, she wrote to Daisy Pearce and was filmed by the Melbourne Football Club as Daisy visited Jasmine and Jasmine and her brother ran out with Melbourne women in one of their games. I am also a proud owner of the work of Andrew Gigatz, another Almanac friend, when he, Slattery Publishing and the AFL released, AFLW See What We Created. It’s a great book with everything you need to know about the season. Another piece of the history that is this year. I reflect on the passion and commitment of women playing football, and wait hopefully for St Kilda to be one of the nominated Clubs to have a women’s AFLW team in 2019. It will be good for our spirits, and the Club, and the community, to have some of the energy that the AFLW has bought to the traditional Clubs. I want some of that thanks AFL as I say goodbye to 2017 AFLM’s Saints footy and prepare for St Kilda Sharks finals and the AFLW Origins match with cuz Gary on Saturday night. It’s been an enormous year of writing, organising, publishing and chatting and may it long continue. This little Sainter is happy to have a break now and gather up the hope and dreams for some finals run…next year. Farewells have been said to greats at our Club Nick Riewoldt and Joey Montagna, and now to season 2017. There will be more tears I expect at the Best and Fairest come October for the Saints. Until then, it’s mental holiday time and a chance to sit back and reflect on what a bloody good year it has been all around. Thank you Almanac community, and John Harms for all that you have done to make this a great year for yours truly. See you next year! Carn the Saints. Revenge is sweet Yvette, but pack your St Kilda 2017 season away with the memo that your Round XVI rout of Yee Striped Marvels cost us the Minor Premiership. Loved the book. A real social history.